Though the Dark Knight and the Man of Steel want to punch each other's lights out in Batman v Superman: Dawn of Justice, we know they're really allies and friends underneath all of the angsty superhero subtext. 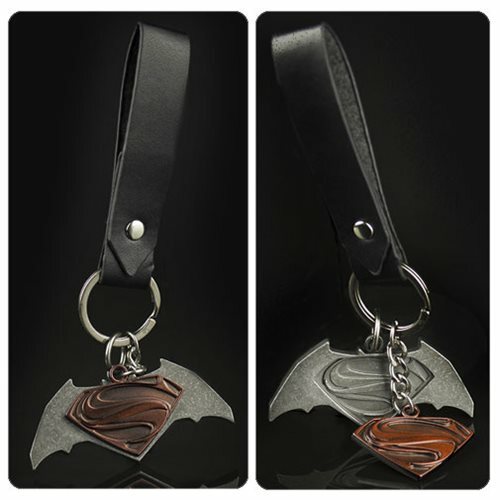 Quantum Mechanix took the official symbol of the 2016 blockbuster movie and made it into a very cool Batman v Superman: Dawn of Justice Key Chain. Superman's logo attaches magnetically to Batman's bat symbol - but if they're not getting along, you can pull them apart. Made of sturdy zinc alloy, the emblems are attached to a black strap that is perfect for tethering to your belt, lanyard or purse key strap. Key chain emblem measures 2 1/2-inches wide. Ages 13 and up.